The Sazerac is ​a timeless cocktail from New Orleans. It is a simple recipe and you may want to think of it as a nice way to doctor up your favorite rye whiskey. The recipe for the Sazerac requires just four ingredients: rye whiskey, a sugar cube, Peychaud's Bitters and absinthe. When made properly, it is one of the best examples of a balanced drink that you will find, with the anise, bitters, and sugar perfectly accenting a good rye. As is the case with many popular drinks, there are varying opinions regarding how to make it. Some drinkers prefer Angostura Bitters, some a specific rye, and many have a preference for the anise liqueur. The recipe below is now considered the 'official' Sazerac recipe (if Herbsaint is used), coming straight from the Sazerac Company. In a mixing glass, soak the sugar cube with Peychaud's bitters and muddle to crush the cube. Add the rye whiskey and stir. Pour the whiskey mixture into the absinthe-rinsed glass. The Whiskey. There are some fantastic rye whiskeys available on the market. Explore them to find the one that makes your ideal Sazerac. The Sazerac company recommends either Sazerac Rye Whiskey or Buffalo Trace Bourbon in "The Official Sazerac Cocktail" recipe. 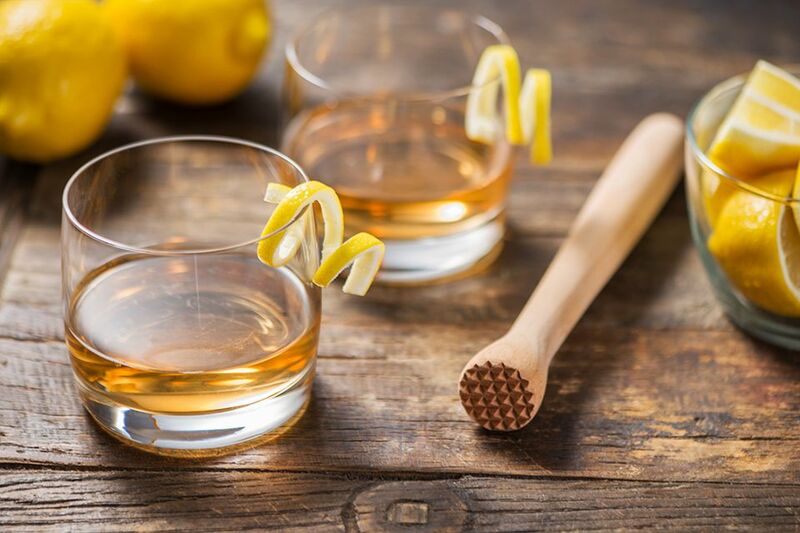 Following suit, you may want to experiment with bourbons as well, though this will not be the traditional Sazerac (and Sazerac enthusiasts will likely scoff at it). The Absinthe. A real absinthe is preferred for the rinse. However, many Sazerac lovers enjoy Herbsaint (and the official recipe uses it). You can also use other absinthe substitutes, though as Jeffrey Morgenthaler points out in The Dos and Don'ts of Sazeracs, Pernod should be avoided because it is sweeter and unnecessary given that there is a full sugar cube in the drink already. If the flavor of anise is not your thing, you can use another liqueur for the rinse. Of course, it will not be a true Sazerac, but many of these variations are just as interesting. For instance, a blood orange Sazerac uses Solerno Blood Orange Liqueur for the rinse, Rittenhouse Rye for the whiskey, and orange bitters. It's a fantastic twist and a more approachable taste. The Twist. Traditionalists will say that the lemon twist should be squeezed over the drink to release its essences. However, they often agree that the twist should not be dropped into the glass itself. It all began for the Sazerac cocktail in 1838 when Antoine Amedie Peychaud, a New Orleans apothecary, mixed cognac with his proprietary Peychaud bitters. In the 1850s, the drink was the signature drink of the Sazerac Coffee House in New Orleans where it received its name and became the first "branded" cocktail. The exact reason for the substitution of rye whiskey for the brandy is unclear, but today it is made with whiskey exclusively. At one point, the Sazerac was even sold as a bottled cocktail, and during the time of absinthe's ban in the U.S., Herbsaint became the anise liqueur of choice. How Strong Is the Sazerac? For a start, use the official recipe with Sazerac Rye and Herbsaint to estimate the Sazerac's alcohol content. It's important to note that Sazerac comes in both 6-year-old and 18-year-old bottlings and both are 90 proof (as is Herbsaint). Second, if you read the recipe closely, you will have noted that there is no ice involved in making a Sazerac. These two factors should tell you that this is not a light drink in any way. Essentially, there is no math needed. Without dilution, the Sazerac remains at the bottling proof of the liquors poured into it. This means that the Sazerac is 45 percent ABV (90 proof) and is one of the strongest mixed drinks you can make. Stick to one a night and all will be well. How Will You Take Your Manhattan?